I wrote last about what I expect will happen at the Paris climate change conference. But what should happen? First, the world must strongly underscore the need to keep the temperature rise below 2°C at the very least. Today, with less than 1°C rise, the world is beginning to experience deadly impacts. In India, we are seeing weird weather, extreme rainfall events and highly variable temperatures that have become the bane of agriculture, destroying crops and causing deep distress. Clearly, even 2°C rise will be too much, but promising anything more ambitious would be delusional. It would mean greatly increasing the rate of emission reduction by the already industrialised countries which is crucial but highly unlikely. 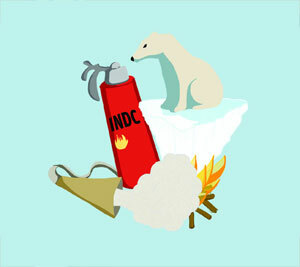 Current emission reduction plans on the table, called Intended Nationally Determined Contributions (INDC), do not add up. Even the UN accepts that the aggregate impact of all the plans will result in a 2.7°C rise. Our analysis shows this is a gross underestimate and that the rise could be well above 3°C. This is when the burden of transition has shifted—analysis of INDC shows clearly that the already industrialised, who have historical responsibility to cut emissions, are doing one-fifth of their share. The developing world is taking on this action. Secondly, all must agree that countries will increase their level of ambition to cut emissions and that this reduction will be based on the fair share of the global carbon budget. This is because arresting the rise in temperature means agreeing to how much carbon dioxide can be emitted between 1870 and 2100. There is a direct correlation between temperature increase and quantum of emissions that can fill up the atmosphere. According to the Intergovernmental Panel on Climate Change, to keep the world below 2°C, with a 66 per cent probability, the budget is some 2,900 billion tonnes of carbon dioxide between 1870 and 2100. Paris agreement must accept that all countries have the right to development and that this requires equitable sharing of the global carbon budget. Of the 2,900 billion tonnes of carbon dioxide, some 1,900 billion tonnes have been used up—this amount of carbon dioxide is already accumulated in the atmosphere. There are some 1,000 billion tonnes left, which can be emitted between now and 2100. But there are two other facts to be noted. One, that the already industrialised countries have overused their carbon quota. But more importantly, their lack of ambition means they will continue to surreptitiously appropriate even more of the budget. The US, for instance, has already used up some 21 per cent of the total carbon budget. Between now and 2030, as per its lacklustre INDC, it will take up another 8 per cent. In this way the INDC is not just a country’s commitment to reduce emissions, it is its intention to occupy global carbon space. Two, by 2030, according to the current emission targets on the table, some 80 per cent of the carbon budget will be used up. In other words, what is available to the world to use up to 2100 will be nearly finished by 2030. This would be fine if all countries were at equal levels of development and would not require any space for growth beyond 2030. But this is hardly the case. India and almost all of Africa, even under the most aggressive plans for growth, would still be struggling to meet the basic needs of people beyond 2030. But by then the carbon budget would be all appropriated and gone. What happens to their right to development? So, thirdly, and most crucially, Paris must agree to operationalise equity by accepting that the level of effort of each country’s INDC will be equal to its share of the global carbon budget. Anything less would be development apartheid. Anything less would be gross climate injustice. Fourthly, to ensure ambition and also operationalise equity, it must agree that it will “stocktake” the commitments made by countries. These commitments must ensure that the world stays below 2°C rise and reflect the equitable sharing of the global carbon budget. Fifthly, the Paris agreement must recognise that it is the world’s poor who are worst hit, even though they are least responsible for the emissions that are leading the world to a climate precipice. The current draft only has some broad statements about the need for all governments to build resilient systems to adapt to climate change. This must change to protect the interests of the poorest and to ensure that not only is the loss and damage estimated but payment is made. Finally, Paris must build the framework for future action, real and meaningful, to combat climate change. To do this it must identify key actions that can be supported through global funding—not ways in which aid is passed off as climate support—to make the transition towards low-carbon growth. The best way to share the limited carbon budget is if countries find ways not to use the space at all. This has to be the promise at Paris. I thankfully acknowledge the receipt of very recent and useful report on Paris climate change conference. I request kindly furnish the detail report on impact of climate change on soil fertility in long run and consequent effect on sustainable productivity of agricultural crops.